When our engineers tell me about what struggles keep them up at night, I get excited because I know some deep learning is taking place. Sometimes engineers can feel their jobs are to constantly bridge the gap between theory and practice. As the realities of the real world emerge, manufacturing and science meet head to head with the engineers right in the middle of the action. Some of the most intense challenges tend to be cross functional in nature when mechanical engineering, quality engineering, and process engineering all intersect. The capability of elastomers is a perfect example. A diagnostics client recruited Natech to manufacture a round, elastomeric plug that assembled into a rigid, plastic body molded in COC to form a radial seal. The client had commissioned single-cavity, steel molds to produce the components. At the end use, lab techs would receive the product, remove the plug, insert the sample, reinsert the plug to form a seal, and shake to mix the fluid sample with highly reactive lyophilized beads. The plug’s radial seal ensured that the mixture would remain within the device during use. If that seal were compromised during the shaking step, the sensitivity of the test could get compromised. In the worst-case scenario user health could be at risk. The material of the elastomeric component had included a lubricious additive which was reacting with the mating COC component. This happened while the product was stored and shipped in the partially assembled state. Over time the lubricious additive caused the two parts to stick together. To remove the plug the lab technician would have to rip it from the mating component. This left a residue ring on the mating component. The residue then interfered with the seal integrity when the plug was reinserted. They asked the Natech Engineers to support a search for replacement materials. After much research, two materials were selected for further testing. A material change can be considered a process change. When working with a new material, the Process Engineer must define the new process for that material. The goal was to establish the capability of the process. If one or both materials could be demonstrated to have a capable process, the client had a viable option. If neither material could demonstrate a capable process, we would have to find another option. Calculating process capability includes the measuring of parts, at timed intervals, throughout a production run. But chasing the capability of elastomers is difficult because elastomeric parts are flexible and out of roundness is a reality. This meant that measuring the seal diameter was far from straightforward. Where and how the measurements were taken could result in wildly different results. Also, due to the durometer of the material and to the geometries of the specific parts, the out of roundness could unpredictably vary from shot to shot. This data could be meaningless to the actual performance of the parts. The parts could be slightly out of round, yet form a liquid seal exactly as needed during use. If the data artificially varied due to inappropriate tools or methods, it could have indicated the process was not capable when it actually was. It could also indicate the process was out of statistical control when it was actually in control. The client would then have to spend extra time and resources to fix something that might not need fixing. Confirm the process was capable. The Engineers started by gathering some quick and easy preliminary data. 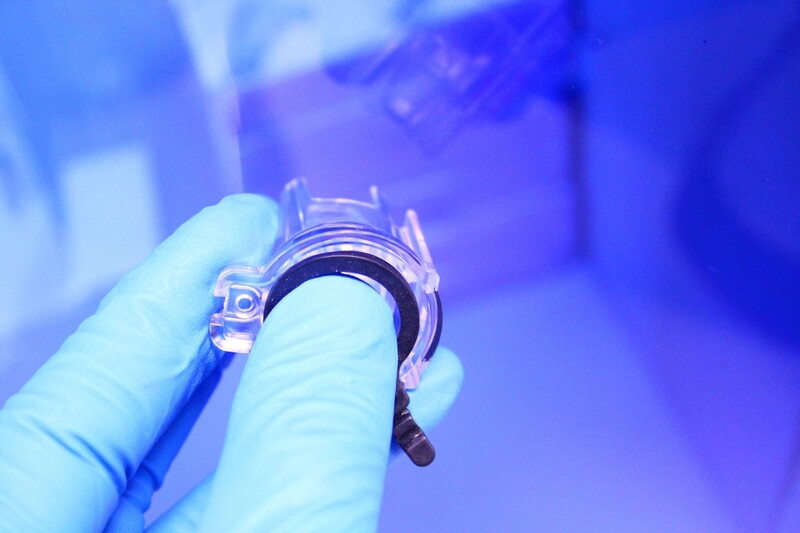 First, they used an optical comparator to look at the outer diameter of the seal bump, which is the only area of contact with the mating component. However, an optical comparator only gives measurements across one projected angle of the round diameter. Depending upon the part’s orientation, results will vary by the degree of out of round. Then the engineer inserted a pin gage into the inner diameter of the part without radially expanding the part. The optical comparator measurements were retaken, and the variation of the results improved but large variation remained, and accuracy was still elusive. Next, a laser scan of the parts with an interferometric laser scanner collected hundreds of data points around the seal diameter. This data allowed the Engineer to calculate a maximum effective diameter, a minimum effective diameter, and a best-fit diameter for each part. The best-fit diameters across 60 shots showed the measurement process to be repeatable. The next step was to confirm the process was in statistical control. For this, the Natech Engineers completed a capability analysis of the molding process with each of the two experimental materials. The upper and lower control limits were calculated for the parts made in each material. With a sample size of three per subgroup, both elastomers were in statistical control. However, the Engineers recommended the first material because it had a much tighter range between its upper and lower control limits. However, just because a process is in statistical control does not mean it is capable, especially when dealing with the capability of elastomers. The parts could have control limits that fall outside of the specification limits, which was the case here. In other words, the process had precision but not accuracy. This is similar to having really good aim but aiming at a spot away from the target. With molded parts, this can mean going back to change the mold. Changing the mold is always an option which brings some degree of cost and risk, so, whenever reasonable, other options are explored to ensure this is the best path. In this case, Natech molded the rigid mating component, and the Engineers had the data on the mating component’s upper and lower control limits. With an understanding of the potential worst-case fit, they went back to the client to recommend no change to the mold. Instead, the specification limits could be adjusted to match the components. The client agreed, and this produced an acceptable fit. Engineers must balance multiple skills to most effectively manage the real-world challenges of manufacturing. Knowing the difference between precision and accuracy helps identify where to focus efforts especially when dealing with the capability of elastomers. Knowing the difference between the statistical control of a process versus the capability of a process helps get to a faster solution and helps avoid creating unnecessary work and problems along the way.